Roentgenium (Rg) was created on 8 December 1994 by S. Hofmann, V. Ninov, F.P. Hessberger, P. Armbruster, H. Folger, G. Münzenberg, and others at GSI in Darmstadt, Germany. This was the second new element created by GSI within a month! Three atoms of #111 were produced in reactions between Bismuth targets and Nickel projectiles. To achieve this, the Nickel atoms were accelerated to high energies by the heavy ion accelerator, UNILAC, and directed onto a Bismuth target. The existence of element #111 was determined by measurement energies of five successive alpha emissions. Intermediate products 109Mt268 and 107Bh264 were the heaviest isotopes of those elements. The approximate half life of 111Rg272 was 0.0015 seconds. Element #111 was immediately assigned the constructed name of Unununium (symbol Uuu). Subsequently 111Rg279 and 111Rg280 have been created with half lives of 0.17 seconds and 3.6 seconds. Because of these independent confirming experiments at GSI and the RIKEN Institut in Japan, in the autumn 2003 professor Sigurd Hofmann and his group were requested to submit a suggested name for element #111. As a result GSI proposed the name Roentgenium which was accepted by IUPAC November 1, 2004. Element #111 was created 100 years after Röntgen's discovery of X-rays. Wilhelm Konrad Röntgen (1845-1923 photo right) was born in Lennep in the Lower Rhine Province of Germany to a cloth manufacturer and merchant. With Wilhelm's mother a native of Amsterdam, the family moved to the Netherlands where Wilhelm received his early education. Earning a Ph.D. in 1869 from the University of Zurich, he worked at several Universities, settling finally in 1900 at the University of Munich. November 8, 1895, Röntgen noted that while he was generating cathode rays inside a Crookes' tube, nearby (up to 2 m away) paper coated with barium platinocyanide lit up with brilliant fluorescence. Knowing that the cathode rays could not penetrate the glass tube, Röntgen realized some unknown radiation, which for the sake of brevity he temporarily called X-rays, must pass through glass and air to excite the nearby fluorescence crystals. 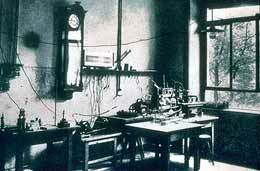 (Photograph at left is of laboratory room in Physical Institute where Röntgen first noted and investigated X-rays. Click to enlarge. Note vacuum pump on low table and connected near the window to flasks to contain gases.) The rays originated from within the glowing Crookes' tube. Röntgen stayed up all night experimenting and for a time ate and slept in the laboratory. Röntgen found X-rays exposed photographic film. Röntgen found X-rays pass through low density materials such as the soft tissue of a hand but less through materials containing elements with higher atomic weight, so that bones would cast a shadow on fluorescent materials or photographic emulsions. (one at left) Within the next few days he determined a great many properties of this radiation. He considered whether X-rays could be a form of electromagnetic radiation. He concluded that if X-rays are a kind of light, then they differed from the highest energy known form of electromagnetic wave, ultraviolet light, in the following properties. It is NOT refracted in passing from air into water, carbon bisulphide, aluminium, rock-salt, glass or zinc. It is incapable of regular reflection at the surfaces of the above bodies. It cannot be polarized by any ordinary polarizing media. The absorption by various bodies must depend chiefly on their density. Röntgen determined that because the X-rays were not deflected by a magnet, they could not be any form of cathode rays. He speculated that instead the X-rays might be longitudinal electromagnetic waves. His preliminary communication was presented before the end of the year. (Read a translation of the original German publication from Carmen Guinta's classic papers.) 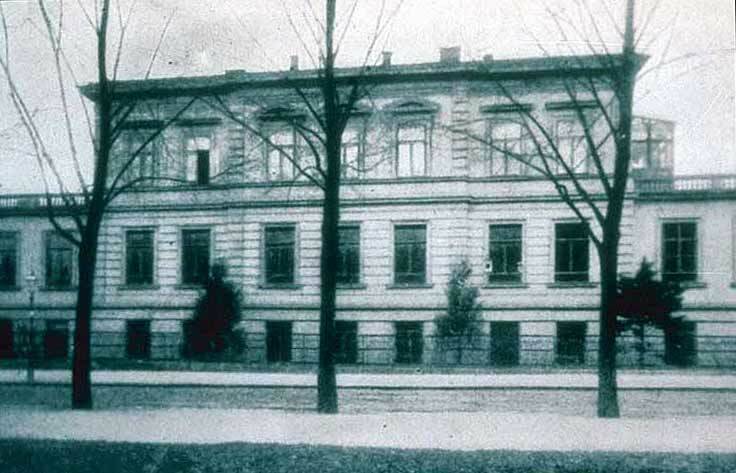 On New Year's Day 1896, Röntgen mailed copies of his paper and photographs to a number of other scientists. The possible medical use of X-rays was realized almost immediately. Unlike other discoveries where the practical applications follow only after decades, physicians were using X-rays within months to inspect internal damage without surgery. Röntgen was awarded and accepted the first Nobel Prize in physics in 1901. However he declined to seek patents or proprietary claims on X-rays, and even discouraged calling them Röntgen rays. Today we know that X-rays are high energy, transverse electromagnetic waves similar to other forms of light. (Electromagnetic radiation ranges from high energy, short wave-length gamma and X-rays, through ultraviolet light, visible light, and infrared, to low energy, long wave-length radio waves.) Despite the fact that Röntgen discovered nearly all the properties of X-rays within the first few weeks of investigation, the temporary name he used for the sake of brevity remains the name still used today.